Samuel Oh ’18 practices signing at the American Sign Language table in Lowell Dining Hall on Nov. 9. UPDATED: December 4, 2015, at 6:46 p.m.
As a student with a cochlear implant, a device that replaces the function of the damaged inner ear, Westley “West” A. Resendes ’12 originally came to Harvard identifying as a hearing impaired person. Upon arriving at Harvard, however, he reached out to University Disability Services and inquired about other deaf students. 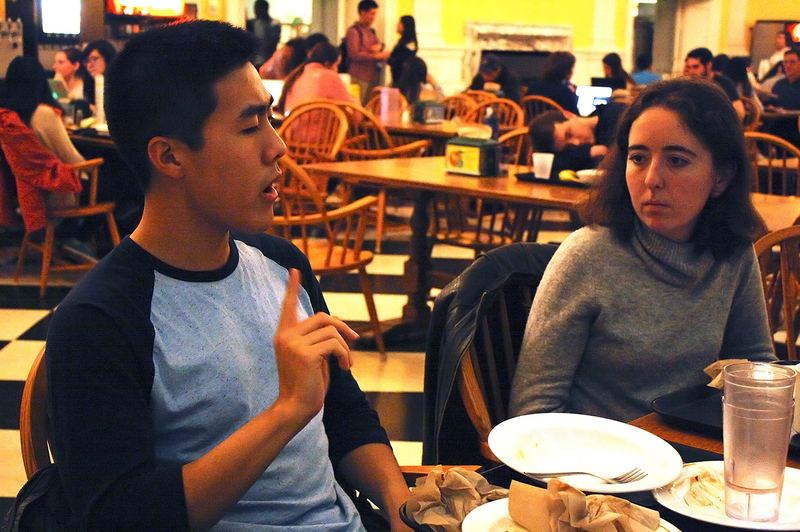 He was invited to an American Sign Language, or ASL, table that met during dinner in Leverett House, where he met other students who were either deaf themselves or advocates, including the leaders of the Committee on Deaf Awareness, or CODA. Resendes, despite being able to hear with his cochlear implant, began identifying as culturally deaf—or “Deaf” with a capital “D,” a word he said serves as a more universal term that can refer both to physical hearing loss as well as associating with the culture surrounding deafness. Pivotal to him calling himself a culturally “Deaf” person, Resendes said his involvement with CODA allowed him to reevaluate his identity and seek to understand the barriers that Deaf students—physically and culturally—face. Harvard’s resources work to ensure that there are no academic barriers for deaf students. Still, some students say that Harvard needs to offer American Sign Language as a for-credit class—something done at many peer institutions, including Brown and the University of Pennsylvania—to fully welcome Deaf students to the University. Harvard’s resources for deaf students have certainly seen improvements in the past decade. Caroline M. Solomon ’96, a deaf biology professor at Gallaudet University—a leading school for the deaf and hard of hearing—said there were no staff interpreters when she arrived at Harvard. Halfway through her first semester, however, the school hired an interpreter full time, who stayed with her for the next four years. Today, deaf and hard-of-hearing students on campus can request specific accommodations. This often includes interpreters attending class with students who identify as culturally deaf, meaning they communicate solely or primarily through sign language, often have Deaf friends and family, and identify with Deaf culture. While the interpreters are vital, they can often be confusing or discomforting to students who are unfamiliar with the experience of being deaf, according to some students. Heather S. Artinian, a culturally deaf first-year student at Harvard Law School, has a team of two interpreters who attend all her classes. Several members of Artinian’s family are deaf and identify heavily with Deaf culture, so she grew up using sign language. She was born unable to hear, but when she was 10 years old, she received two cochlear implants, learned how to speak English, and switched from a school for deaf children to a mainstream one. “I’ve kind of been going to school with the hearing world for a long time. And every time I go to a new environment it is always that cultural shock for everyone else,” Artinian said. According to Artinian, many of her peers have never met or interacted with a deaf person—physically or culturally—and are unsure how to communicate with her. During the first few weeks of any class, she makes sure to introduce herself, explain that she can hear with her cochlear implants, and tell others to tap her on the shoulder if she does not hear them. Her cochlear implants aid Artinian’s hearing and make it easier her to have conversations with one or a few people, but in large groups or at large events she still prefers to use an interpreter to help. Artinian said Harvard’s resources are exceptional, and she never experiences problems requesting interpreters for outside events. She only needs to submit a request. Resendes, who was the director of CODA when he was an undergraduate, also praised the resources Harvard provided to him. He had interpreters for lectures, sections, and thesis meetings, as well as outside events at the Kennedy School of Government and Kirkland House. One distinction between Resendes’s experience and non-Deaf students’ was that he had to solidify his schedule, sometimes weeks in advance, to secure an interpreter. “There were occasions when interpreters were unavailable for a lecture or a meeting, and I either decided to skip the event or decided to go and try my best to understand what was going on. Fortunately, those instances were few and far between,” Resendes said. Still, these positive reviews of Harvard’s resources are not universal. Sarah D. Gluck, a deaf graduate student pursuing a degree in speech and hearing bioscience and technology, said University Disability Services is not as efficient as it could be in allotting interpreters for outside events. Gluck graduated from Rochester Institute of Technology, a school she said had a notably large Deaf community and resources for Deaf students. She points to University Disability Services’ policies—requiring students to place interpreter requests for outside events with two to three weeks notice, if possible—as a source of frustration. “Hearing students have the privilege of walking through the hallway and seeing a poster for something, like a science lecture or talk that’s happening that day or later that week, but it’s hard for me to have any sort of spontaneity,” Gluck said. Gluck said this makes it difficult to become involved with things outside of the classroom. She said she would have liked to attend a recent meeting held by a group of graduate students trying to unionize, for example, but she could not secure an interpreter for the event. While many peer institutions work offer American Sign Language as a for-credit class, Harvard does not provide this option, and some Deaf students and advocates say it should to better integrate them into the campus community. In the 1990s, Harvard’s Linguistics Department offered ASL classes but canceled them in response to financial constraints. Today, the only formal ASL instruction at Harvard is offered by CODA, which runs classes on Sundays in three different levels of difficulty for no credit. Because an outside ASL instructor, who CODA hires, teaches those classes, students must pay for them out of pocket. According to CODA’s director, Erica X Eisen ’16, the organization began offering those weekend classes because Harvard removed ASL as a for-credit language course option. Eisen, a former Crimson Arts chair, co-led a movement last year to put a question calling for Harvard to reintroduce for-credit ASL classes on the Undergraduate Council’s fall election ballot. The measure passed with overwhelming support, prompting the UC to advocate for CODA and their push for ASL course options. Progress halted, according to Resendes, when administrators indicated that Harvard will only offer a language class if at least one student has a “demonstrated academic interest” in it—that is, the intention of conducting research on ASL. According to Dean of Undergraduate Education Jay M. Harris, his office can arrange language tutorials if students demonstrate that they will do research related to that language. “We are happy to arrange classes for students who can articulate a research agenda that involves the study of that language and a faculty member who is willing to supervise that research,” Harris said. “The University needs to reconsider its outdated position on ASL,” he argued. ASL is the third most common language, other than English, taken by college students nationally as of the fall of 2013, according to the Modern Language Association’s most recent report. In line with these statistics, many of Harvard’s peer institutions have begun to offer it as a for-credit course. Brown has offered ASL since 1995 and for credit since 2005, according to Timothy B. Riker, a visiting lecturer in ASL there. At the University of Pennsylvania, students may pursue ASL for credit and even a Deaf Studies minor; according to Jami N. Fisher, the ASL program coordinator at Penn, the school has offered ASL since 1996, and it has fulfilled the world language requirement since 2001. Offering ASL classes at Harvard could mitigate the stigma that has historically surrounded deafness, integrate Deaf students in the campus, and expose other students to a new culture and community, Gluck said. “Offering ASL would go so far in supporting Deaf students and the Deaf community at large,” Resendes said. “ASL is a modern language highly relevant to American society, and for those studying a profession involving a considerable component of social interaction, an ASL course would be a truly valuable asset when these Harvard graduates interact with Deaf people. —Staff writer Meg P. Bernhard contributed to the reporting of this story. An earlier version of this article incorrectly stated that Westley “West” A. Resendes ’12 identified as a “hearing person” when he arrived at Harvard. In fact, Resendes identified as a hearing impaired person. The University has been slow to re-adopt ASL compared to peer institutions after it abandoned the program in 1994, citing financial difficulties. According to a recent study commissioned by the Modern Language Association, as of 2013 ASL is the third most-enrolled language, besides English, in colleges across the nation. At its core, the purpose of language is communication and doubting a people’s language merely because one cannot “write it” is fundamentally discriminatory.